Rangashala: Is it better to not have a national team? Basketball is a great sport, no doubt. And the more kids we get playing the sport the better. In the USA and Philappines no one cares about the national team. People only follow domestic basketball. So what I am asking is, do we even need national team in some sports. Why not just enjoy it domestically. My post is half serious. so don't take it too personally. I do not agree with you. Very little government money is invested in Basketball in Nepal; infact none. But the results received until now is great. Beating Qater and KUwait in basketball in no joke. How much money is invested in Football and Cricket. 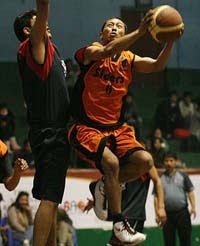 Nepal Should rather focus on Basketball in team Sports in Nepal. It is space friendly and if planned well, can win silver medal in South Asian Region. Can Football and cricket dream to win silver in South Asia. Thanks for your post. Love your enthusiasm. My point is why not just have great domestic basketball scene? Why do we need to worry about international basketball. In the Philippines they have great domestic basketball - thousands of fans go to see college games. They don't care about international basketball at all. Can't it be the same in Nepal? Yes having good domestic basketball is a great way. But in the context of the downfall of football and cricket in Nepal (in the team sports), it would be better to promote Basketball and give it priority it is starting to get result internationaly.